Hi everyone and once again Happy Holidays! Has Spring finally reached your doorstep? We managed to have a nice family walk beside Lake of Geneva (Leman) and it was not cold at all! ALready some flowers in full bloom despite the fact that just few small kilometres away the mountains are covered in snow as it was snowing two days ago! Anyway we are all craving for Spring! Children did not want to come back home:) And my spirit is all longing to warm weather. I prepared for you a tag with a background from Lozzy’s Digi Papers, collection Pastel Mixed Media. I decided to leave it as it is- all pastely and very much reminding me of Spring, just awesome as it is! The beautiful chipboard from Snip-Art was embossed with Lindy’s Purely White EP . 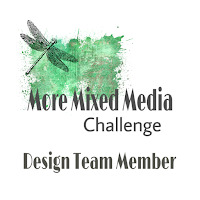 This is my DT reveal for More Mixed Media challenge blog. Will you play along? See you soon!